5/1/16 - 6/1/16 ~ . Blood donation is among the highest service one can render to humanity. 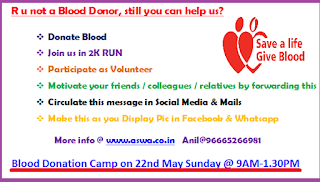 With this thought, AMMA Social Welfare Association is organizing Blood Donation camp on 22nd May 2016 (Sunday). 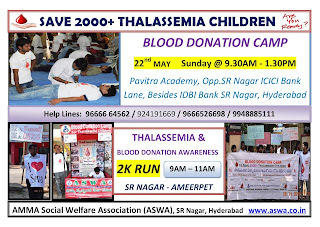 This small activity can save lives of many Thalassemia affected children. They require blood for every 15 days for their survival. Hence we request for your participation and also request you to invite your friends, relatives and other people you know for this noble cause. Amma Social Welfare Association successfully conducted 22 blood Donation Camps with your great support. We are expecting the same support this time also. In summer they require more blood, due to Summer Holidays they get less blood donors. You all know that ASWA's goodwill lies in its transparency. Every year we release a booklet compiling of its activities & funds. We have been receiving immense of response for this from many related parties of ASWA. We cant found any better stage than our 8th anniversary celebrations to launch this. Our chief guests Sri. Venugopal Reddy Garu, Jawaharlal Nehru garu and Sundar Raj Perumal garu inaugurated our 8th Year Book Let. 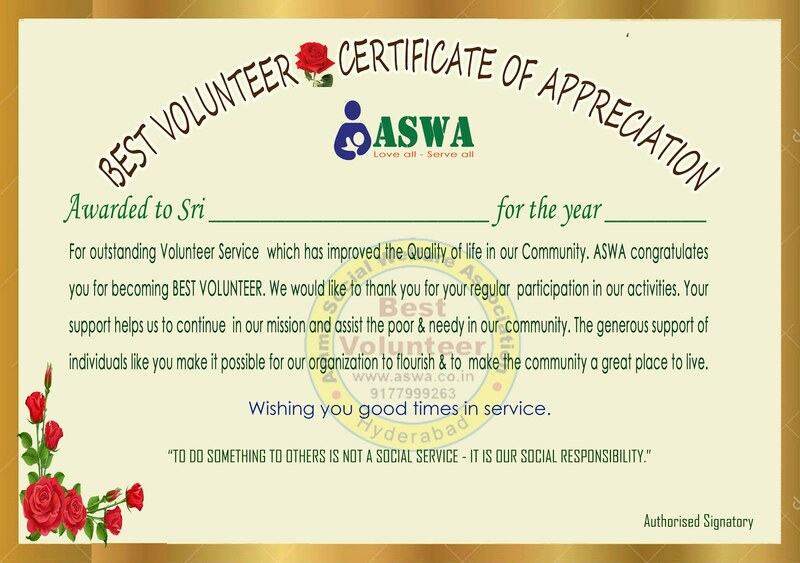 For ASWA, every volunteer is equally important and crucial for its growth and expansion of services to poor & needy. 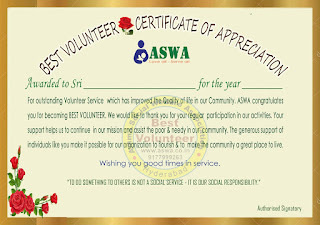 There are few volunteers who are working for the society through ASWA from many years. They are the real reason for ASWA's today stay. We inspired & motivated with their selfless services. We proud to have such volunteers and we are getting self-motivation from their dedication, determination and discipline. Of course, these all are the BEST NEW VOLUNTEER APPRECIATION AWARD WINNERS in previous years. Apart from the above, there are other classes of volunteers, who joined hands with ASWA in this year / previous year and participating regularly & actively for more than 8 times in a year. Surely, their presence added value to our team. So it's our prime responsibility to recognize their services and motivate them to do more. 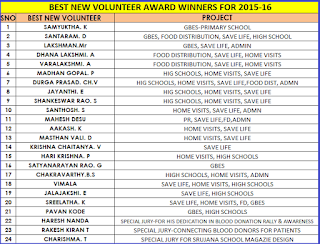 The following volunteers truly deserve ASWA BEST NEW VOLUNTEER APPRECIATION AWARD FOR 2015-16. We honoured them with a Medal & Certificate. 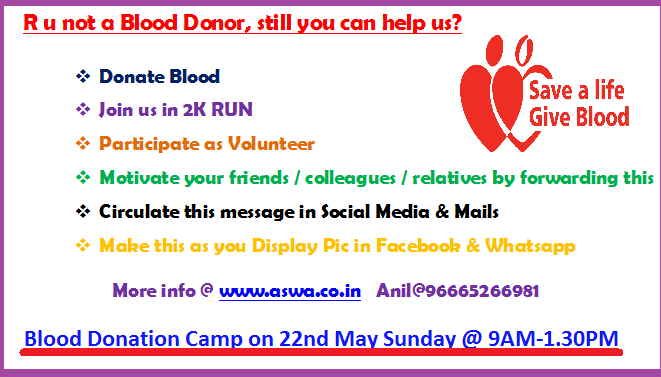 5 members didnt attended the event, those will be facilitated in our next blood donation camp on 22nd May, 2016. I request every one to join hands to congratulate their dedication in serving others. It's really hard to get even 1 unit of blood when it's really required. 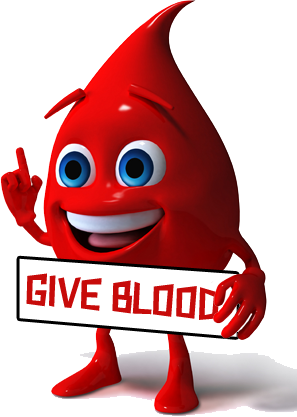 Donating blood is equal to giving rebirth. 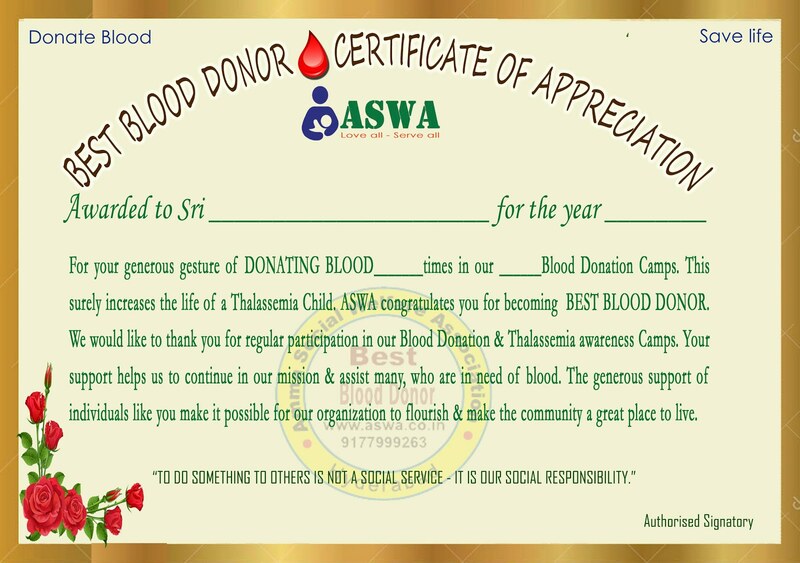 Like previous years ASWA decided to honor the services of our Blood Donors who are regularly donating Blood i.e. 3 /4 times out of 4 camps we conducted in a year. 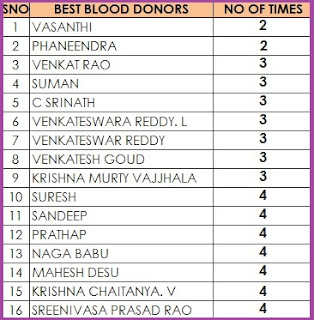 The following are the list of the BEST BLOOD DONORS. It means they are regularly donating blood for every 3 months, which is the most NOBLE and GREATEST act. I request every one to join hands to congratulate them. 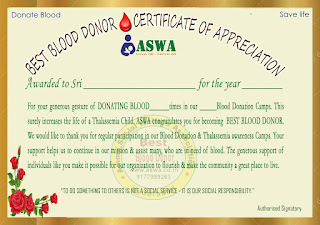 2012-13 we introduced "BEST BLOOD DONOR APPRECIATION AWARDS" to appreciate "Regular Blood Donors" who are donating blood regularly for Thalassemia Children and to create more awareness about Blood Donations, . 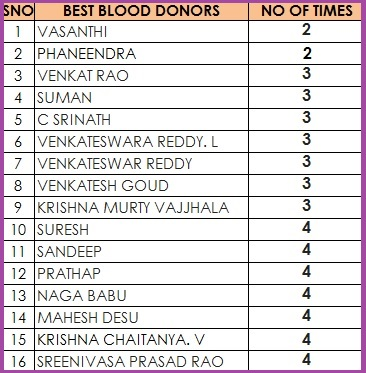 We have conducted 22 blood donation camps till now, including 4 in the last year. 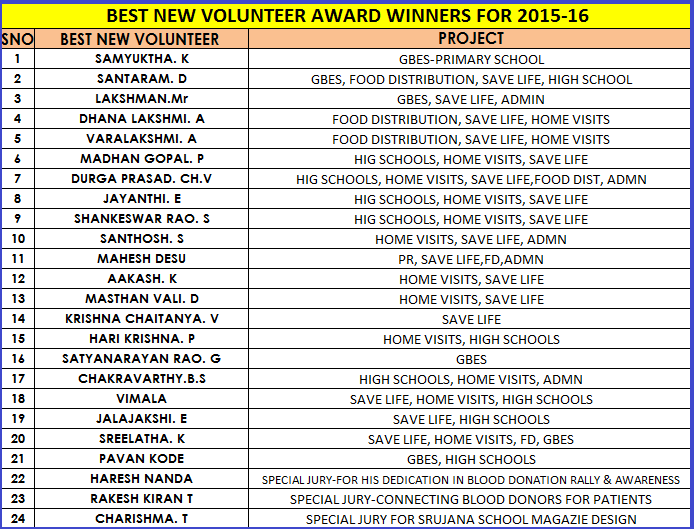 Fortunately we got 16 members, who regularly donated, including 2 special jury awards (Vasanthi & Phaneendra). 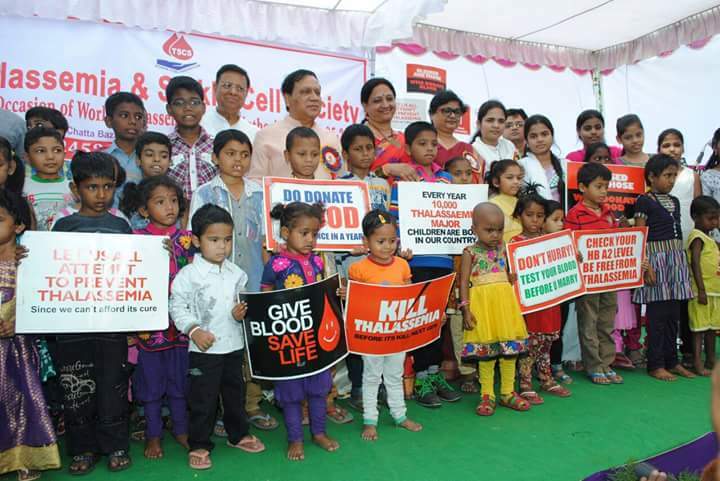 There is no words to appreciate their dedication in regular blood donation to save little Thalassemia children. We honoured them with a Medal & Certificate. 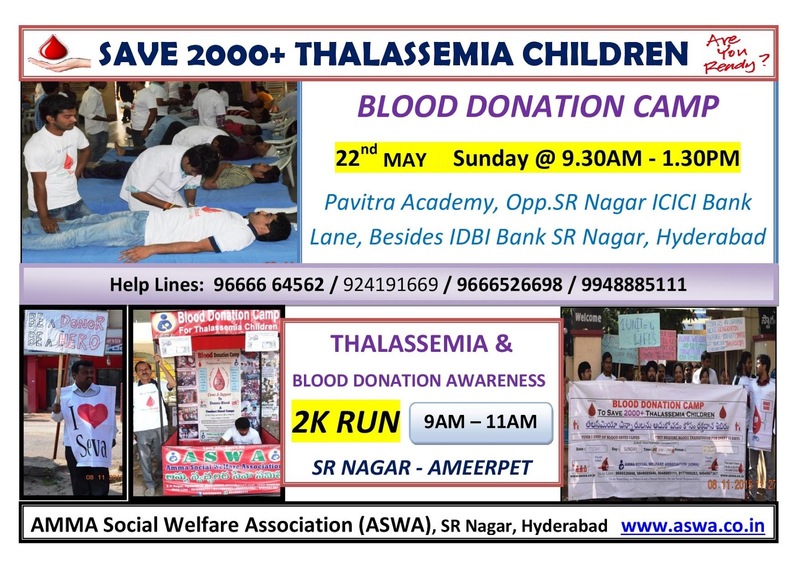 5 members didnt attended the event, those will be facilitated in our next blood donation camp on 22nd May, 2016.